Objective: To describe audiometric characteristics and middle and inner ear malformations in two patients with velocardiofacial syndrome. Method: Audiometric evaluation, computerized tomography of the temporal bones and analysis of DNA for multiple markers of 22q11 region were performed in two patients with clinical signs of velocardiofacial syndrome. Results: Conductive hearing loss related to chronic otites media and middle and inner ear malformations were found, the latter with the use of reformations based on multislice acquisitions on of the computerized tomography of the temporal bones. Conclusion: We consider it to be highly important to carry out a thorough evaluation and monitoring of the hearing evolution, as well as the occurrence of symptoms related to the vestibular function in patients with velocardiofacial syndrome. From the radiological point of view, attention should be given to the use of high quality techniques for the tomographic study of temporal bones. The audiogram shows air tone thresholds of 15dB HL at 250, 500, 1000 Hz, 20dB HL at 2000 and 4000Hz and 25dB HL, 60dB HL and 70dB HL (respectively at 4000, 6000 and 8000 Hz) in the right side. Air tone thresholds of 15dB HL at 250 and 500 Hz, 20 dB HL at 1000 and 2000 Hz, 25dB HL at 4000 Hz and 40dB HL at 6000 and 8000 Hz in the left side. Bone tone thresholds of 5dB HL at 500 e 1000 Hz, 0dB HL at 1000 Hz and 10 dB HL at 2000 and 4000 Hz. SRT was 35 dB HL in the right and 30 dB HL in the left. WRS was of 100% at 60 dB bilaterally. Timpanometry was of type B and the acoustical reflex was absent bilaterally. 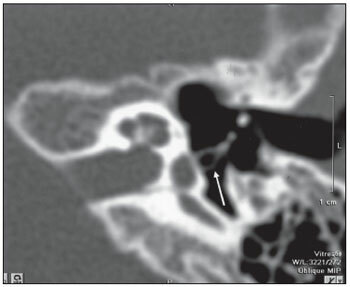 The CT of temporal bones shows signs of bilateral inflammatory otomastoidopathy, a common cavity between the vestibule and the lateral semicircular canal on the right side and an assimetry of the lateral semicircular canal on the left (Picture 1). 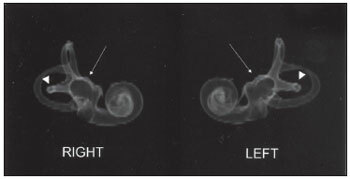 Ossicles had a normal configuration. Picture 1. 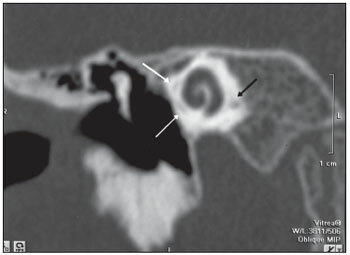 Patient 1: CT showing bilateral inflammatory otomastoidopathy and a common cavity between the vestibule and the lateral semicircular canal at right(arrow inA). 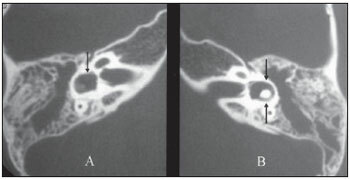 Assimetry of the lateral semicircular canal at left ( arrows in B). CT of temporal bones shows a bilateral displasia of the lateral semicircular canals, which are shorter in comparison with the posterior and superior semicircular canals, globosity of vestibules (Picture 2 and 3) and mild pericochlear radiolucent foci (Picture 4). Deformity of the stapes was found at the left side, characterized as a kinking of the posterior crus (Picture 5). This finding was only detected after an oblique reformation parallel to the stapes (about 30o to 45o). Picture 2. Patient 2: 3-D images from the osseous labyrinth based on CT showing bilateral displasia of the lateral semicircular canal ( arrowheads ) and globosity of the vestibules ( arrows). Picture 3. Patient 2: Axial and 3-D reconstruction showing displasia of the lateral semicircular canal (arrowheads in A and B) in comparison with the posterior semicircular canal (double small arrows in B) and globosity of the vestibule (long arrows in A and B). Picture 4. Patient 2: Mild pericochlear radiolucent foci (arrows) in CT coronal view. Picture 5. Patient 2: Oblique CT reformation with evidence of deformity of the posterior crus of the left stapes (arrow). 1. Master's degree. General Director DERDIC_PUCSP. 2. Doctoral Degree. Radiologist - Imaging Doctor - Hospital Beneficência Portuguesa de São Paulo. 3. Graduation in Medicine. Otorhinolaryngologist - Phoniatrist at DERDIC/PUCSP. 4. University Diploma in Phonoaudiology. Phonoaudiologist at DERDIC/PUCSP. Article received on January 14, 2008. Approved on March 19, 2009.